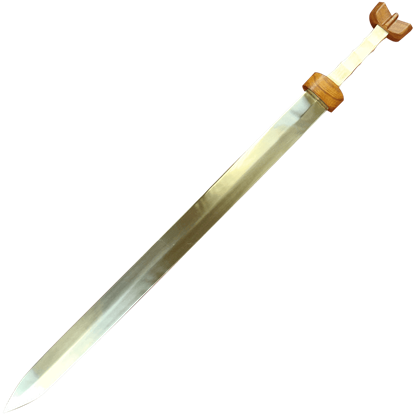 The primary weapon of legionnaires, Roman soldiers would use their gladius in close combat as a stabbing, cutting, and chopping weapon. The Roman gladius was two-edged and featured a tapered point. The knobbed hilt often included ridges for the fingers to enhance its solid grip. 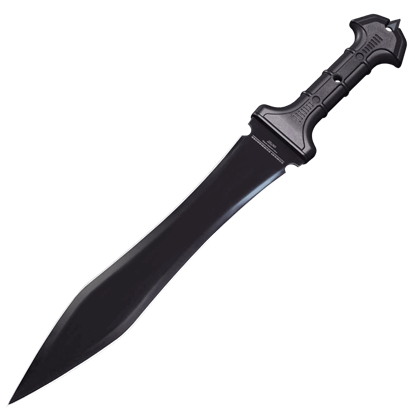 In warfare, the gladius would often be thrust at the abdominal region or slashed at kneecaps vulnerable below the enemy shields. 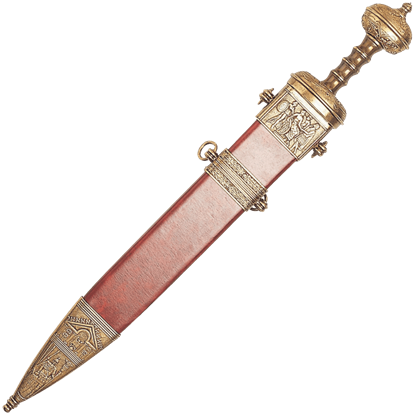 At Buying a Sword, we carry many excellent examples of this historical weapon, including several Mainz gladius and Pompeii gladius replicas. 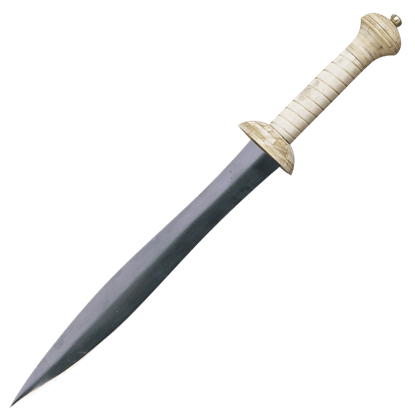 Our selection features both functional gladius and decorative gladius versions, including ornamental gladii with gold detailing and battle ready Roman swords will full tang construction. Whether you are interested in re-enacting the life of Julius Caesar, training for your next battle, or showcasing a unique Roman blade, you can find many great options here at Buying a Sword. 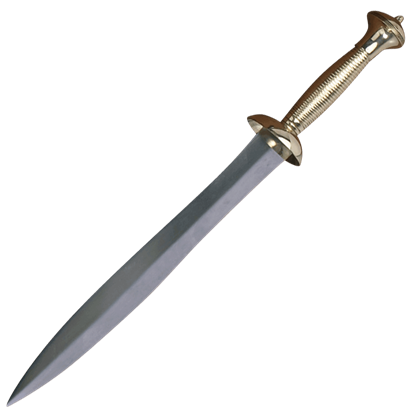 Used by a variety of Roman soldiers, the Spatha was created for heavy infantry due to its in length over the traditional gladius. Our Bone Grip Roman Spatha offers a large reach and is easy to wield for variety of swordsmen. Perfectly suited to the combat of the gladiatorial arenas, short weapons like this Bone Handled Gladiator Dolch were used by many a Roman gladiator. As weapons, they also helped ensure an exciting match for the spectators, too. Perfectly suited to the combat of the gladiatorial arenas, short weapons like this Brass Handled Gladiator Dolch were used by many a Roman gladiator. As weapons, they also helped ensure an exciting match for the spectators, too. 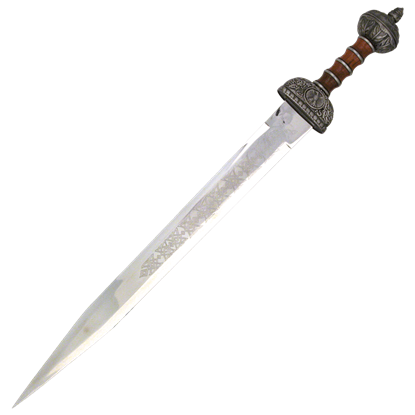 The Roman Sword, or Gladius, evolved from weapons captured during the Roman campaign in the Iberian peninsula. By the first century A.D., it had been refined to the form shown in this replica by Denix. The great Julius Caesar, head of the Roman Empire, left his mark in history as a military leader and an Emperor. The Julius Caesar Sword, with its Roman styling, is a reminder of the power and prestige of the great Roman Empire. Imagine the dirt beneath your feet, the sun on your face, and roar of the crowd as you prepare yourself for the fight of your life. Earn the right to live and your freedom with the elegant Combat Commander Gladiator Sword.